It’s probably safe to describe Identity - a tale about 10 strangers trapped at a motel during a thunderstorm - as an overlooked horror film. 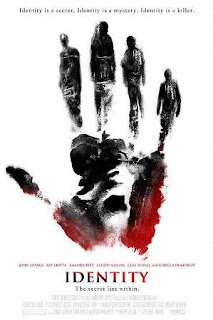 Directed by James Mangold and released in 2003, Identity sports a twist ending and came out at the tail end of a period when many other films did as well (The Sixth Sense (1999), Fight Club (1999) The Others (2001)). If Identity was or is written off because of its ending, it really isn’t fair to the film. It possesses a well-crafted creepy vibe throughout (the scenes that feature the little "As I was going up the stair" poem that bookend the film are pretty chilling), a superb cast and a capable director in Mangold. The film begins with a quick explanation that a convicted psychopathic murderer named Malcolm Rivers (Pruitt Taylor Vince) is about to get a new trial the night before his scheduled execution due to new evidence. Elsewhere, ex-cop Ed (John Cusack) and nine others become stranded one-by-one at a motel during a thunderstorm. A cop (Ray Liotta) shows up transporting a violent prisoner (Jake Busey), and soon all hell breaks loose. Basically, everyone starts dying. So yeah, the twist. Everything at the motel is in the mind of Rivers, the psycho set to go on trial. Cusack and all of the other characters are actually divergent personalities of Rivers' and his psychologist (played by Alfred Molina) is trying to get Rivers to find out which of his personalities is a killer. The film has a great spin on the “every character has to die” rule. It’s explained that all of the characters at the motel are “dying” because they’re actually just Rivers' personalities being wiped out as part of a conscious (subconscious?) effort by the madman. The rest of the plot isn’t that important, or at least, the plot inside Rivers' mind. Stuff happens, but it’s just kind of filler (if there’s one thing wrong with the movie, the dialogue might be a bit better in some spots and the story flow could have used a little improvement [okay, two things]). I might be a little biased because this film actually did quite well in theaters. Maybe it was just me that was sick of twists at the time of its release (I actually liked it a bit more this time around). In conclusion, while overlooked, Identity is a great horror thriller that plays with the genre and keeps its audience entertained and guessing. This review is part of The Large Association of Movie Blogs' Movie of the Month Blogathon for March 2013. Loved it! I thought it was really fun! Pete - I really enjoyed it this time around. It's definitely not a film to be overlooked. Thanks for reading! Oh, this movie.. I remember seeing it years ago and really loving it. I was all for the twist at the end. But yes, the movie sustains a really creep vibe that makes it a very worthy film to watch. Shala - It seems like people are divided on this flick. You loved it or you hated it at first and you loved it or hate it now. The vibe is definitely what makes the movie stand out. Thanks for reading!